Definition at line 26 of file CQCurrentValueTable.h. Definition at line 27 of file CQCurrentValueTable.cpp. Definition at line 63 of file CQCurrentValueTable.cpp. Definition at line 144 of file CQCurrentValueTable.cpp. Referenced by CQLayoutMainWindow::parameterTableValueChanged(), and setAllBoxesChecked(). Definition at line 158 of file CQCurrentValueTable.cpp. Definition at line 34 of file CQCurrentValueTable.cpp. References mpCheckAllButton, mpTable, mpUncheckAllButton, slotCheckAllClicked(), slotUncheckAllClicked(), tableValueChanged(), and verticalHeader(). Definition at line 185 of file CQCurrentValueTable.cpp. 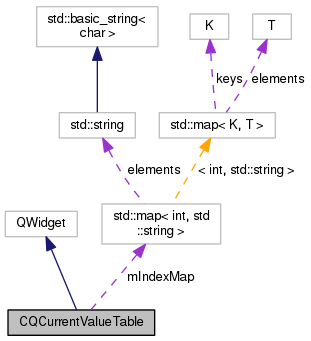 Definition at line 100 of file CQCurrentValueTable.cpp. References CQLayoutMainWindow::addItemInAnimation(), getKeyForRow(), mpTable, and CQLayoutMainWindow::removeItemInAnimation(). Referenced by setAllBoxesUnchecked(), and slotCheckAllClicked(). 111 // is cell a QCheckTableItem? Definition at line 131 of file CQCurrentValueTable.cpp. Definition at line 137 of file CQCurrentValueTable.cpp. Definition at line 180 of file CQCurrentValueTable.cpp. Definition at line 175 of file CQCurrentValueTable.cpp. Definition at line 67 of file CQCurrentValueTable.cpp. References FROM_UTF8, mpTable, and setKeyIndex(). Definition at line 95 of file CQCurrentValueTable.cpp. Definition at line 165 of file CQCurrentValueTable.cpp. Definition at line 170 of file CQCurrentValueTable.cpp. This slot is caled whenever a value in the table changes, i.e. whenever a species is activated or deactived by it's checkbox. This information is broadcasted by emitting another signal which contains the row number. Definition at line 200 of file CQCurrentValueTable.cpp. Definition at line 80 of file CQCurrentValueTable.cpp. Referenced by setValue(), and CQLayoutMainWindow::updateValueTable(). Definition at line 190 of file CQCurrentValueTable.cpp. Definition at line 32 of file CQCurrentValueTable.h. Referenced by getKeyForRow(), and setKeyIndex(). Definition at line 34 of file CQCurrentValueTable.h. Definition at line 33 of file CQCurrentValueTable.h. Referenced by getValueForRow(), init(), numRows(), setAllBoxesChecked(), setNumCols(), setNumRows(), setRowInTable(), updateRowInTable(), and verticalHeader(). Definition at line 35 of file CQCurrentValueTable.h.